In a previous blog titled Play The Hand You’re Dealt I discussed a strategy for acquiring and using inexpensive rough lumber. My woman friend and partner, Willow, put that strategy to use in building the foot stools shown at left. But first a little background. In the fall of 2003 Willow was pondering what to give our grandchildren for Christmas. Our children and their families visit us for a few days each Thanksgiving. It is my favorite holiday of the year. During that 2003 Thanksgiving visit one of my granddaughters wanted to join Willow in baking pies. We have a Shaker style step stool we keep handy just for such occasions. Our granddaughter used it to reach the counter so she could join in the fun. 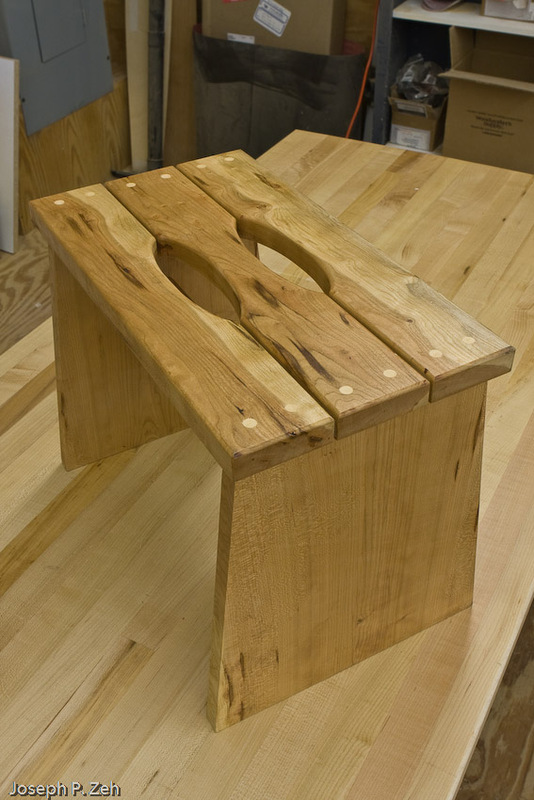 This particular type of Shaker stool can be unstable if not placed against something to keep one from stepping too close to the back and going beyond the stool’s center of gravity. My granddaughter did just that and fell to the floor, thankfully unharmed. Willow decided there and then that grandchildren needed a more safe step stool design. This, she decided, would be their Christmas present. The job of designing one fell to me. The Shaker stool, stability aside, was light and perfectly suited for the desired purpose. It was made of pine which made it light so that kids 3 years of age could pick it up and move it into position. All it needed was legs that splayed to keep its load within its center of gravity. I drew up some plans and provided Willow with some poplar. 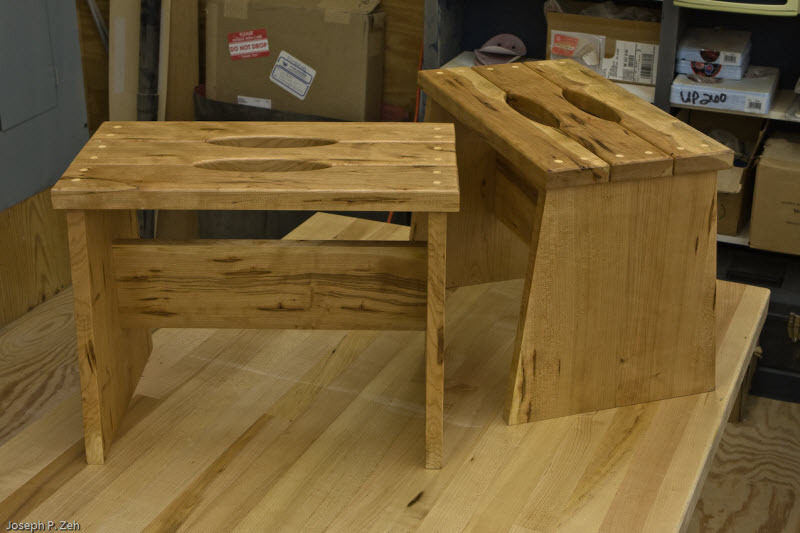 She set about making four stools; one for each of our three grandchildren, and one for our college aged daughter for use in her dorm. Each stool was painted, including their name in a contrasting color. They were a big hit. Each time we see the kids grab a stool and move it into place we get a warm feeling, because we know they will have those stools well into their adult life. 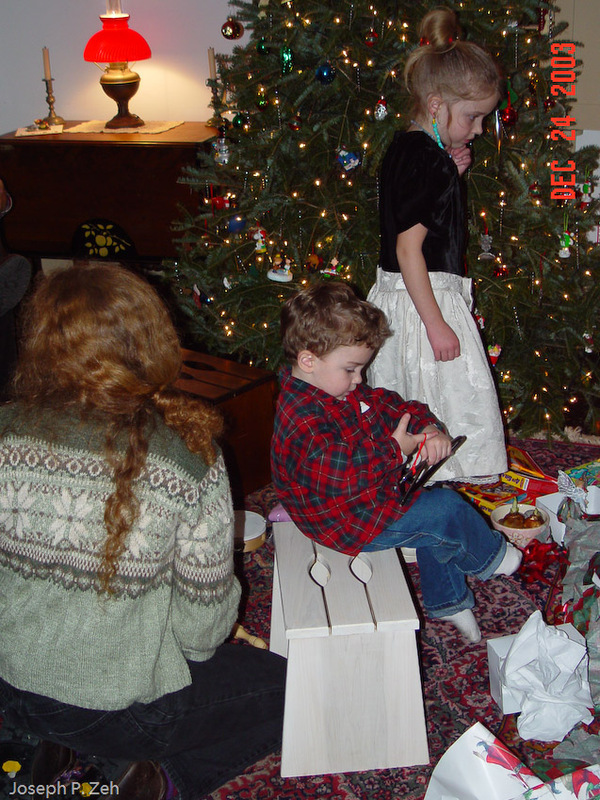 At right my grandson is sitting on his stool while opening additional gifts he received that year. Back to the present. Willow has wanted to make a few more of these stools to keep at our homes in Worthington MA and Eastham MA on Cape Cod. So recently she again asked for the drawings and some reject lumber. I have a stack of black cherry that is loaded with pitch pockets and is a mix of sapwood and heartwood. It is structurally stable and when finished with a natural finish is quite attractive. I often use it for the backs of furniture when the back is not visible, such as the back of a chest of drawers. This time Willow built three of them. Being made from cherry they are quite a bit heavier than the originals, but fortunately our grandchildren are older and able to handle them. The design is simple. The end pieces are a trapezoid which provides the stability. The cross brace is attached to the ends with biscuits. The top slats are attached using long wood screws with large thread. All joints are also glued. The top slats have a handle shaped into the slats so the stool can easily be picked up with one hand. The screws are countersunk and filled with wood filler to provide a contrasting image. Seven stools later we and the grandchildren still enjoy this handy little home tool. If you are strapped for a gift for someone of any age, think about a foot stool. It takes only a day to build several, they are very useful in the home, they will serve the recipient throughout their lifetime and they are likely to be passed on to other family members. Not to mention, it is a good way to use otherwise scrap lumber. Joe on It Works! At Least Empirically. Greg Andre on It Works! At Least Empirically. CabWriter 2.0 for Furniture Design? Yup! 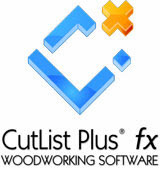 Fine Woodworking – Design. Click. Build. 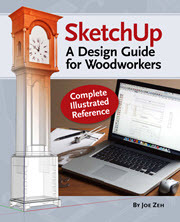 Chiefwoodworker's Blog is proudly powered by WordPress. 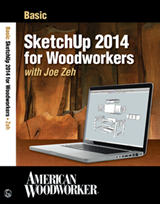 Copyright © 2008-2014 Joseph P. Zeh, Swamp Road Wood Works & Chiefwoodworker's Blog. All Rights Reserved.